This time of year always reminds me of a time in my life that was a pivotal, life changing period for me. In 1988, I was transitioning out of BMX and BMX Freestyle and was looking for something individual, something I could do that didn’t require a team or a group but was something I could do myself, as an individual. I had a few friends that felt the same way, we really just wanted some way to express ourselves that was a little nonconformist, more individual and where social, economic or any other categorization made no difference. BMX tried to meet this bill, but it was a bit of an outcast elitist club. It required a large investment, which I made with the help of my parents and a paper route, but it still felt too ……connected and beau monde, especially in our small town and area of Illinois. In small town midwest america, this is pretty common. If you’re not in, you’re out, or at best you’re on the periphery. I didn’t want that. I already felt a tad alienated having been an only child for 12 years and suddenly having 2 brothers I had to share my oversubscribed, working parents with. The late fall of my 8th grade year 2 new kids moved to town. Both were from out of state and both were obviously a bit different than the standard mid Illinois small town kids. They skated. They were both cool and very open about skating. They were happy to kick around on a board with whoever wanted to. I had investigated skateboarding around 1984 and found it difficult and frustrating. The problem was that I didn’t have a good grasp of how the equipment worked or anyone that could show me the proper way to do anything. Also, I had a Valterra, which was a low quality excuse for a decent setup. That had now changed. I had not one, but two independent examples of skateboarding. One from the east coast, one from the west. I was sold. I had to learn this. This was my entry into a life defining part of my existence. For Christmas my mom drove me the 30 minutes to the decatur bike shoppe. This was the only place I knew that had skateboards as I’d seen them when I was there getting BMX parts. I toiled over what to buy, this and a few shirts were to be my christmas present. The clothing was a required part of the gift, I was able to sweet talk her into letting me get some skate shirts. I had absolutely no idea what was necessary. I had enough money to get a deck, grip tape and that’s basically it. I had to use the trucks and wheels from my 1984 Valterra (which didn’t fit right) on this new acquisition. I chose (based on the graphic) the Vision Psycho Stick. This deck was ….awful. In retrospect it had a terrible shape and was awkward to ride. I had no idea, but I was ecstatic. I was allowed to pick out a few shirts as well, which to this day were some of my most coveted and prized possessions. These were also selected based on graphics since I’d seen to skate videos and had only really read a handful of Transworld and (my preferred) Thrasher Magazine. It should be noted that I kept a thrasher subscription, nearly nonstop until 2004. 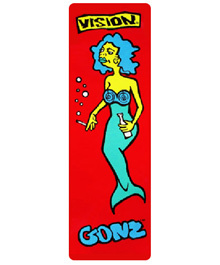 The gonz mermaid was one of my most prized possessions until its demise in the mid 2000s….nearly 15 years after I got it. 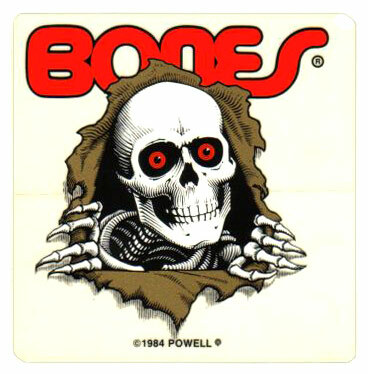 I wore those shirts and skated in my parents garage in bitter cold for the entire season. I coud not spend enough time on that board. 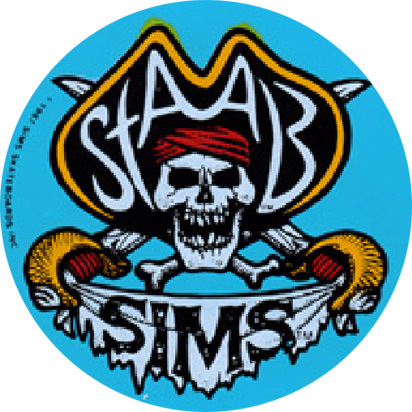 It be a defining element in my life, something that shapes me, and that I miss terribly to this day, at almost 40 years old. This time of year always makes me lament the time I wasted away back then. I could have skated more. I should have. I wouldn’t trade it for the world. It’s one of my fondest memories. I skated nearly every day from 1988 until 1996 and at least few times a week until 2004. I would still skate if I had any cartilage left in my knees.